Pierre Camatte, right, pictured with an unidentified man, was kidnapped in November. (CNN) -- Al Qaeda's north African wing has threatened to kill a French hostage unless four of its members are released within 20 days. Al Qaeda in the Islamic Maghreb (AQIM) made its demand in a statement dated Sunday, said the Washington-based Intelcenter, which monitors Islamist Web sites. The Frenchman, Pierre Camatte, was kidnapped from a hotel in Mali in November. The group wants the government of Mali to free four prisoners in exchange for Camatte's release. "Let France and Mali be forewarned that we give 20 days to fulfill our just demand or the two governments shall be fully responsible for the life of the French hostage," the statement said. 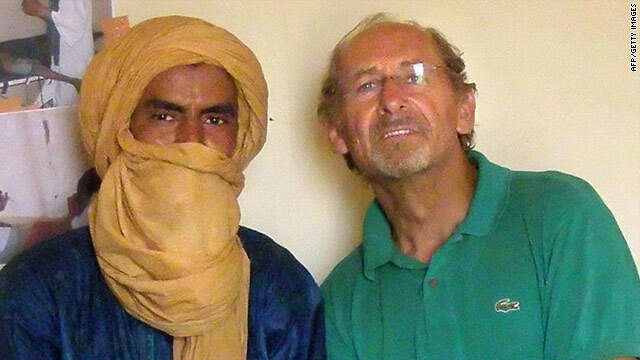 Camatte was abducted four days before the group kidnapped three Spanish aid workers from neighboring Mauritania. The Spaniards were still alive as of late December, according to the Spanish government. It has said that it is working toward their release, but has not revealed specifics. In June, AQIM executed a British man after the British government did not give in to its demand to release Abu Qatada, a Jordanian considered to be al Qaeda leader Osama bin Laden's right-hand man in Europe. In its message on Sunday, the group referred to the execution, saying, "We also call upon the French public opinion and the hostage's family to pressure (French Prime Minister Nicolas) Sarkozy's government to prevent the repetition of Golden (Gordon) Brown's folly against his British citizen." The group began life as the Salafist Group for Preaching and Combat, with aspirations to overthrow the Algerian government. About 2004, it joined forces with al Qaeda and extended its reach across North and West Africa, carrying out a spate of kidnappings and deadly attacks.